Revised and released in January 2017, our Writing for Biomedical Publication workbook has been designed to provide prospective authors with a practical step-by-step approach that will help them transform their data into a highly readable and logically presented manuscript. As competition to publish in top-tier biomedical journals continues to increase, authors need every means available to increase the probability of having their next manuscript accepted for publication. 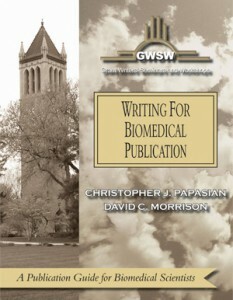 Writing for Biomedical Publication provides essential guidance that will diminish the real and perceived obstacles encountered when preparing research manuscripts for publication. It also offers a comprehensive understanding of current trends in the rapidly changing landscape of biomedical publication. Further, the difficult subjects of authorship, how to select the right journal for manuscript submission, and how to respond positively to reviewer’s comments are addressed, as well as many other contentious issues. Written by academicians for academicians, this volume provides prospective authors with an all-inclusive grasp of how to solve important problems that can, and do, complicate the publication process. This revised edition (January 2017) has been extensively updated and reformatted to be more user-friendly.